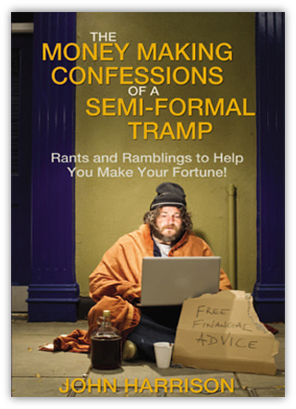 There can be few books about making money which start out at a Hurricane Preparedness and Debris Management Conference, but this is no ordinary book about making money. In a journey through its 21 chapters you’ll find yourself whisked around various improbable events and locations. One minute you’ll be amidst the glamour of Simon Cowells birthday party, and the next at a Car Boot sale in a sun scorched field in Rotherham. Just when you’ve got used to the luxury of a five star Mediterranean cruise, you’ll be brought back down to earth with a trip around the living hell that is Ikea. And along the way you’ll encounter such strange bedfellows as a Killer Tomato, Michael MacIntyre and a real life giant with digestive transit issues. All these elements are brought together for a reason, to give shape and framework to a critical money making idea which could take you from where you are now, to where you’d really like to be. You can order the book on approval. It comes fully guaranteed, and if you’re unhappy with it for any reason whatsoever, you can simply return it for a full unconditional refund. You can order in complete confidence. If you’re unhappy with the book for any reason whatsoever, or can’t see how you can put the insider information it contains to use, then you can simply return it within 30 days and receive a prompt and courteous refund of every penny you’ve paid. Is that fair? To order your copy on approval, click here or you can call our 24 hour credit card hotline on 01709 361819. Many thanks (again) for your latest volume. Immensely enjoyable: very easy, natural, non-literary, down-to-earth style – feels like you are `one of us’, despite your £££ millions. I found it very educating and very funny, especially chapters 14 and 15 which made me laugh more than any stand up comedian can. Just like to say that it was a brilliant read! I thank you very much for the best read I’ve had in ages. As well as being very informative, it had me laughing out loud at your superb use of the English language. advice on money making was inspired. We have all just finished reading your book and our sides are still aching with laughing so much. Thanks for sending your book Money Making Confessions of a Semi-Formal Tramp. The Ikea chapter was so funny and I would like to use it as the basis of my next speech for Toastmasters International. Thanks once again for giving my wife and I many a good hearty laugh. Very well written and refreshing reading. A must for anyone starting a new business, of any sort. We were soon both in tears rolling with laughter. One cannot escape the brilliant lessons you attach to your anecdotes. One of the best motivational books I have ever read – and considering my current library od business books totals around 700 this is saying something. The combination of your humorous writing skills and thought provoking and insightful wisdom make it rather a compelling read. Hope you don’t get a big head but a pat on the back is most definitely in order. Glad you liked it. Keep lending out. I like to be spread around!